Welcome to the website of the Human Motivation and Affective Neuroscience (HuMAN) laboratory! Research at the HuMAN Lab aims at providing a better understanding of the physiological, cognitive, affective, and behavioral aspects of motivation in humans. Our research has a strong emphasis on nonconscious (i.e., implicit) motivational processes that occur and influence behavior without the person becoming aware of them. We also explore how implicit motives relate to and interact with people's conscious goals and beliefs about their motivational needs. The methods we use to explore these questions include non-declarative personality assessment, measurement of salivary hormone levels, assessment of basic cognitive functions, Pavlovian and instrumental conditioning, and brain imaging. The HuMAN Lab is supported by grants from the National Science Foundation, the National Institutes of Mental Health, and Deutsche Forschungsgemeinschaft. To find out more, please use the navigation menu at the top of the page. A new study by the HuMAN Lab, to be published in the journal Motivation Science, suggests that what people are motivated to do as adults may depend in part on the hormones they were exposed to during their prenatal development. In a study with a large sample, about half of them women, Schultheiss and colleagues determined participants’ motivational needs with a picture-story task and their prenatal exposure to testosterone and estradiol by measuring their ring finger length. Previous studies have shown that ring finger length is sensitive to exposure to testosterone and estradiol in the first trimester of pregnancy and stable thereafter when controlling for overall hand size. Typically, individuals with relatively long ring fingers were exposed to more testosterone and less estradiol prenatally; for individuals with relatively short ring fingers the opposite holds. Schultheiss and colleagues found ring finger length to be associated with individuals’ motivational needs for power and achievement. However, the associations were different for men and women and stronger overall in women. For instance, in women higher achievement motivation in adulthood was associated with shorter ring finger lengths suggestive of low testosterone and/or high estradiol exposure; in men the association tended to be reversed (see Figure). The figure shows ring finger length in relation to index finger length as a control for overall finger length on the left-hand axis (digit ratio). Higher digit ratios reflect shorter ring fingers, lower digit ratios reflect longer ring fingers. 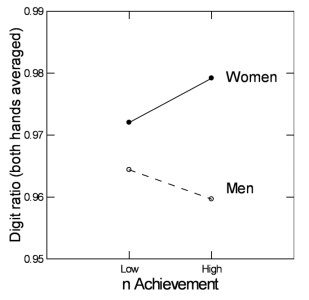 In women, variations in the need for achievement (n Achievement) were associated with shorter ring fingers; in men they tended to be associated with longer ring fingers. 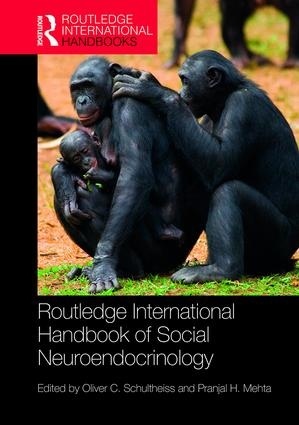 Oliver C. Schultheiss (Friedrich-Alexander University) and Pranjal H. Mehta (University College, London) are the editors of the new Routledge International Handbook of Social Neuroendocrinology. The handbook is the first to bring together a broad variety of findings, topics, and perspectives emerging from the nascent field of social endocrinology. Featuring 39 chapters by author teams from the US, Canada, the UK, the Netherlands, Germany, Sweden, and Israel, it provides state-of-the-art accounts of research on dominance and aggression; social affiliation; reproduction and pair bonding (e.g., sexual behavior, sexual orientation, romantic relationships); pregnancy and parenting; stress and emotion; cognition and decision making; social development; and mental and physical health. The HuMAN-Lab provides research opportunities for foreign students interested in doing work that is closely related to the Lab’s mission. However, due to the requirements of the German university system, regular 3-year positions with a teaching load of 3 courses/year are only available to applicants with documented oral and written fluency in German. Applicants who can obtain a stipend (e.g., through the DAAD or funding agencies from their home country) are also welcome to apply. All applicants must have a master’s degree in psychology and must submit, along with documentation of their degrees, a curriculum vitae, a list of at least two individuals who can comment on their academic achievements, and a letter of intent that sketches out in 2 pages or less the specific research aims and interests of the candidate and how they fit the HuMAN Lab’s mission.